Hyderabad has somehow found a way to reinvent itself in some way every time I visit. The city is itself has two contrasting landscapes, dotted with mosques, bazaars and monuments through Old City on the one hand, yet filled with skyscrapers and sprawling malls through Hitec City on the other. The result is a diversity in culture, architecture and food that is so unique in India. I’ve been visiting Hyderabad about once a year for the last fifteen years – the city has somehow found a way to reinvent itself in some way each time I return. With a population of over 7 million, Hyderabad is India’s fourth most populous city. It is well known for its wealth of pearls, jewels and diamonds – in fact, Osman Ali Khan, the last Nizam of Hyderabad was declared the wealthiest man in the world in 1948 and ranked fifth in Forbes’ list of wealthiest individuals of all time. The city itself has two contrasting landscapes – on the one hand, it is dotted with mosques, bazaars and monuments through Old City, and on the other hand, it is filled with skyscrapers and sprawling malls through Hitec City, home to multi-national giants such as Microsoft and Google. 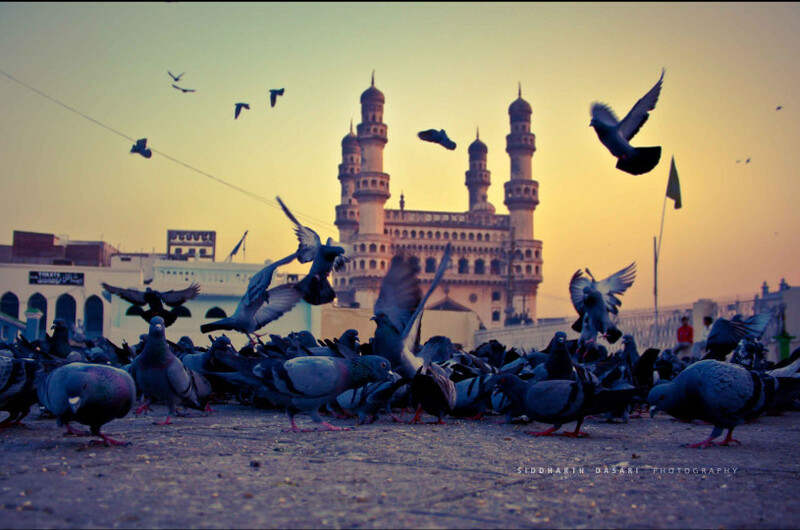 A result of its Nizam heritage, Hyderabad has the highest Muslim population of any major city in India (41% of the population). Coupled with the majority Telugu-speaking population, the result is a diversity in culture, architecture and food that is so unique in India. Start the weekend off early in the evening with the best chaat in the city at Maharaja Chat, located in what could be mistaken for deserted parking lot in Kondapur during the day, but one that springs to life around 4pm as teenagers, young adults and families flock to this Bandar for their evening snack. Try their signature masala pav bhaji (the best I’ve ever had), but be warned that spice levels of this are not for the faint hearted so opt for the regular pav bhaji or papdi chaat if you prefer something milder. Take a drive to Tank Bund, the area enclosing Hussain Sagar, the lake built by Ibrahim Qutub Shah which today links the twin cities of Hyderabad and Secunderabad. The view from Tank Bund at night is spectacular – on one side, you see the outline of what people call a “diamond studded necklace” of the shimmering lights along Necklace Road, and on the other, the majestic glowing statue of Buddha resting in the middle of the lake. Part take in the daily festivities with locals – walk along Necklace Road and walk to see the musical fountain at Lumbini Park. There’s a certain charm about seeing what many middle-class families do on their outing out to Tank Bund. If you’re feeling hungry, head to Paradise Restaurant for what many say has the best biryani in town, otherwise go to the Altitude Lounge at the Marriot to enjoy a cocktail with an amazing view of Hussain Sagar. Start early in the morning to make your way to Old City, characterised by chaotic buzz of bicycles, motorbikes, autorickshaws and cars. Start the Old City Walking Tour at 10 am at the stunning Chowmahalla (“four palaces”), which was once the official residence of the Nizam of Hyderabad. Visit the iconic 400 year old Charminar (“four towers”) and the Mecca Masjid, before you make your way to the colourful and buzzing Laad Bazaar, a market popular for bangles, pearls, jewellery and fabrics. Once a major pearl and diamond trading hub, Hyderabad was once known as the ‘City of Pearls,’ so be sure to check out the pearls here if you are interested! Gorge on delicious food from any of the street vendors, before heading over to Golkonda Fort, a fortress built by Ibrahim Qutub Shah to protect the city from the Mughal invasion from the North and one that used to store diamonds including the world famous Kohinoor, which today is part of the British Crown Jewels, and the Hope Diamond, now on display at the Smithsonian National Museum of Natural History. Go on a trail through Golkonda, during which you learn about the 700 year history of the fort and its architectural and engineering accomplishments, and also visit the Qutub Shahi Tombs, which house the remains of the Qutub Shahi kings. Complete your historical experience in style by splurging at the spectacular Falaknuma Palace, originally built in 1893 as the residence of the Nizam of Hyderabad and refurbished meticulously by Taj Hotels in late 2010. Aptly named Falaknuma, which means “mirror of the sky” in Urdu, the palace has uninterrupted views of Hyderabad due to its elevated position. Dining here is a truly unique experience, one where you are treated like royalty – upon entering the grounds, you are transported by horse drawn carriage to the palace steps and escorted into the spectacular lobby. Walk around the palace and explore its various rooms and gardens – the Jade Room is my favourite. Head up to Adaa, one of the two restaurants at the palace known for its Hyderabadi specialty dishes including the slow cooked lamb and dum biryani. In my opinion, Hyderabad has the best biryani in the world, and outside of home, this was the best biryani I’ve had. You can then grab a drink at the Royal Terrace, a spectacular balcony that extends out to the rest of Hyderabad, or indulge in some Royal hookah at the Hookah Lounge to experience the art practiced during the princely times. Be sure to book your meal ahead as only registered guests are allowed into the Palace premises. Start your day with an authentic Andhra meal at Southern Spice, Banjara Hills to sample the spicy, non-vegetarian food they are known for – try their mutton miryalu and bommidala pulusu (fish curry). After brunch, drive to the newer side of Hyderabad, Hitec City (short for ‘Hyderabad Information Technology Engineering Consultancy’) through the landscape of towering skyscrapers and plush gardens, a marked contrast to the chaotic and mosque-studded Old City. Finish off your weekend with a meal and drinks at Over the Moon at Hotel Daspalla, with an amazing view of the new Hyderabad. Travspire recently launched experiences in Hyderabad, including the Old City Heritage Walk and Golkonda Trail. If you’re interested, please book here.